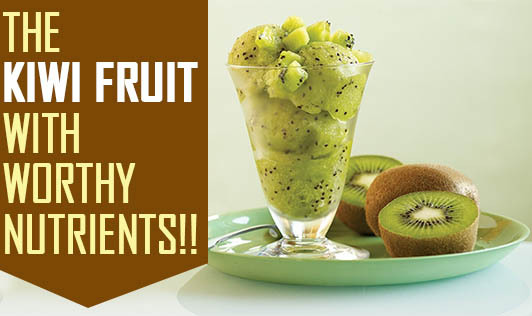 The Kiwi fruit With Worthy Nutrients!!! This fruit with worthy nutrients is restricted to exotic salads or tarts. Have you ever bought them when you see them in the super market? Don't most of us ignore them just because they are expensive? Let me give you some reasons to buy them on your next visit to the supermarket. • Kiwi, being the national fruit of China is called the Chinese goose berry for it's green flesh loaded with nutrition, cream-like texture and the several health benefits it carries. The flavor of the Kiwi fruit is an amalgamation of different flavors like melon strawberry and a tinge of peach. • The Kiwi fruit can be enjoyed in smoothies, sprinkled into your morning break fast cereal mixed into fruit salad, or eaten plain at its best. • They are a very rich source of vitamin C, fiber and magnesium. • Few studies have shown that eating kiwi fruit regularly reduces asthma symptoms in kids. • Dietary fiber in kiwis helps to keep your digestive system healthy by preventing it from colon and stomach cancer. • It is beneficial in pregnancy as it contains folate which is necessary for cell development. • The goodness of vitamin C in kiwi fruit can protect children from flu and cold. • Enzymes like actinic and bromic acid present in kiwi act as a food tenderizer. These ingredients help in softening the fruit. Try to cut them just before eating to prevent sogginess of the fruit. • The fiber in the skin of the fruit is one of the best known pre biotic foods. These help in growth of healthy bacteria in the intestine. • Studies have proved that the kiwi fruit has the ability to protect the body and repair any damaged DNA, that could otherwise lead to cancer. However, due to the vitamin K content in the fruit, people on anti coagulants need to talk to their doctor before including the fruit regularly in their diet. We know kiwi is an expensive fruit; but, have a look at their benefits. Don't you think it's worth each rupee you pay? ?